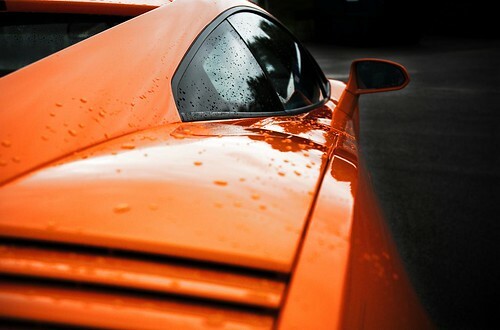 blog.borud: 4 tips for taking pictures of cars. 4 tips for taking pictures of cars. A lot of people have asked me how to take pictures of cars. First off I'd like to point out that I'm a hobbyist photographer. After years of taking pictures I only have a rather basic grasp on taking pictures, but I am still learning a lot of new things all the time. Also, I am not sure I have that much to teach other people about photography, but since a lot of people do ask, I'll try to jot down some tips. Note that these are just tips. I am going to mention a lot of stuff a beginner doesn't necessarily know and I won' be providing any explanations for most of them because other people have written about these things much better than I can. The idea is that you can use this as a starting point and then look for the things you don't understand on the net. For example, if you don't know what "aperture" means, look it up. Learn how to use the camera. Focus on understanding aperture, shutter speed and ISO. Forget about everything else and shut off all the automatic gadgetry -- most of it is just useless anyway. Learn how varying the aperture affects the picture. Make sure you understand terms such as "depth of field". Avoid shooting in program mode ("P") or auto (usually a green setting on the wheel of SLRs I've used). I only use program mode as sort of an emergency setting -- when I know the camera has the wrong settings for the light and the important thing is just to get the shot within the next 2 seconds. But even then you have to know what the camera does. For instance you need to know how the camera calculates exposures. Tip: use spot metering mode and make sure the point you use for measuring is roughly equivalent to 18% gray. Some people use matrix mode. I don't understand fully how the camera calculates the exposure in matrix mode so I avoid it. Use spot metering, learn how to identify areas in your picture that are equivalent to about 18% gray, lock exposure to that measurement and shoot. Use aperture priority ("A" on most cameras) or manual mode ("M") and take lots of pictures. You don't need to learn what every knob does, but if you can pick up a camera, make some test-shots and end up with good settings in manual mode within just a few seconds, you are going to have a huge advantage. Again, learn the basics. Get an instinctive feel for your camera. You need to be able to adapt quickly to changing light conditions. 2. Choose an interesting angle. Most people walk up to a car and then snap pictures of it from a standing position. Then they upload their pictures and they look exactly the same as a billion other pictures of the same car. Try to find interesting angles. Crawl on the ground, go up close, move around the car and look at it. Designers spend billions each year trying to come up with unique designs for cars. Try to figure out what makes a car interesting. Look for details. It is okay to choose odd angles and just take pictures of small details. For instance, a lot of sports cars have interesting hip/shoulder areas. If you are always shooting the car from the front, three-quarters or the side, you are going to miss out on these details. It is like taking pictures of Elle MacPherson and then ignoring the fact that she has a rear end that'll make your eyes water. 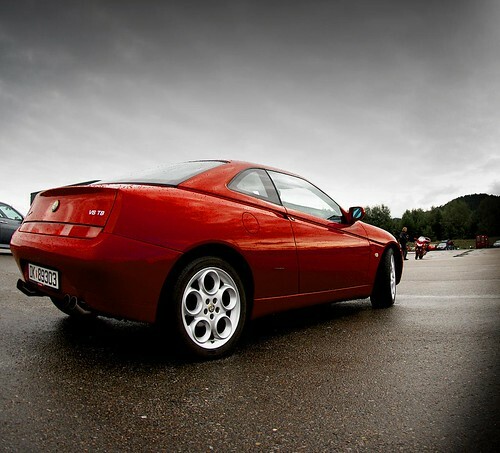 Some cars have dramatic lines that are just too distinct to ignore -- lite the 916 series Alfa Romeo GTV. Look at the razor sharp line that goes from the boot lid all the way down to the front wheel-arch. There's drama and balls to that design. Capture it in the image. Other cars, like the Alfa Romeo Bertone coupes have a butch front end. The car looks like a real bully of a bulldog. Especially if you take off the front bumper. That's a car that you want to shoot from the front -- but you can be creative about it. Also, don't be afraid of using wide-angle lenses. I hear a lot of bitching and moaning about how fisheye lenses distort everything and how the result seems unnatural. Utter rubbish. Don't be afraid of taking screwy pictures -- screwy is good. What I have a hard time understanding is the "purists" who insist on not doing any post processing to their pictures. Taking the picture is just half the job. Creative post processing is what breathes life into pictures. What you do is up to you, of course, but most pictures can do with some cropping, sharpening, color adjustments, exposure adjustments, contrast adjustments etc. Learn how the tools work and be quick about your initial editing. If you take a lot of pictures you want to develop a bag of tricks that can be applied quickly. You want to be able to quickly determine if a picture can be made good -- if you can't think of anything: move along to the next. You can always go back and revisit pictures. 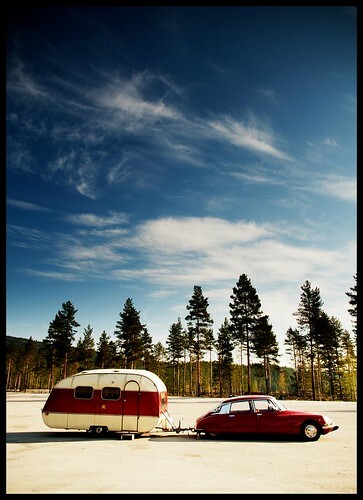 The picture of the Citroen with the camper van sat in my archive for months until I revisited it. The first time around I had no idea what to do with it. Months later I played with it for 3-4 minutes and uploaded this picture to flickr -- I didn't think it was that great but a lot of people really liked it. The first version was just incredibly dull. I happen to like really saturated colors and harsh contrasts. I also like to use vignetting -- and not just around the eges: sometimes I use Photoshop to draw vignettes to drown out the visual clutter around the car. To focus the image more dramatically on the car. That isn't everyone's cup of tea, but I think that especially when you shoot cars, colors that are saturated to the point where it almost becomes obscene and color drips off the picture looks a lot better than just trying to keep things natural. Go a little bit crazy. 4. Look at what others do. It is no coincidence that Top Gear is a popular TV show. Look at the way they shoot cars. Sure, they do video, but the same principles apply. Look at the angles, look at the use (and abuse) of colors. Look at the crazy, odd vignetting they do. These people know how how to shoot cars. They can even make the cars designed by Chris Bangle look good and they even managed to make a Lexus look exciting in one of their episodes (which is no small accomplishment given that almost all cars built by Lada look more interesting than a Lexus). Also look for what not to do. Look at dull photos of cars and ask yourself what went wrong. Why does the photo not stand out? What would you do differently? Anyway, I said I didn't have much to teach you. The most important point of them all is "learn the basics". To get a nice picture, first you have to get the shot. Great explanation. I'm an Alfa fan, I was looking for some nice pictures of the GTV (my dad owns one) and I came across this thread. Really usefull!!! I'm a graphic designer, but my photography is quite poor and I'm always looking for improve a little. Thanks! Some of the best pictures I found on your blog. You’re doing great job. Here is Bentley Export UK also provide important tips that make your car photo look professional and profitable. Free car repair manuals Alfa Romeo is from manuals.co and there are some information on Alfa Romeo car too. The Alfa Romeo 159 is a compact executive car produced by the Italian manufacturer Alfa Romeo between 2005 and 2011.